File sharing and online collaboration is the driving force of Dropbox. It does a stellar job in this area, but like all tools, remains subject to the human factor. 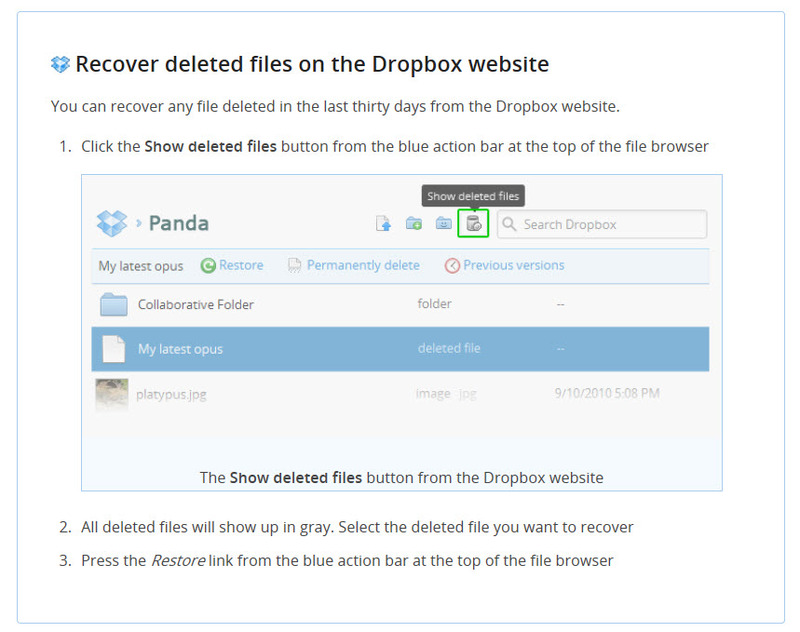 What if you, your staff, or someone with whom you are sharing a Dropbox folder accidentally deletes a file? Most everyone has had this experience on their personal computer, so it’s bound to happen sooner or later in the cloud. 1. Backup. I can’t say that enough times. See How to Backup Your Computer on the PLF Web site for a thorough discussion on the subject. Select Practice Aids and Forms > Technology. 2. Train. Make sure everyone you add to your Dropbox account understands how it works. I’m writing this post because my husband and I had a personal experience with a family member who mistakenly deleted some shared files. We successfully restored the files on the Dropbox Web site (and had a backups, just in case). The family member deleted files after she received an e-mail message warning her that her Dropbox folder was full. At the time our shared Dropbox folder was at about 50% capacity. She had one item in her personal Dropbox folder. Whether this was an error by Dropbox or malicious spam, we don’t know. After the family member deleted the Dropbox files she also deleted the e-mail. 3. Share thoughtfully as all users are not equal. However, if you follow the other two take-aways (backup and train) sharing is far less risky. The October issue of the Oregon State Bar Bulletin contains a must-read article entitled The Data Dilemma: Law Firms Strive to Strengthen E-Security as Potential Threats Continue to Rise. Consider cyber insurance (Your Professional Liability Fund coverage does not protect against data loss).